A self marking exercise on the application of Pythagoras' Theorem. Here are some questions which can be answered using Pythagoras' Theorem. You can earn a trophy if you get at least 14 questions correct. 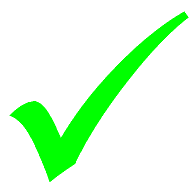 Each time you finish a question click the 'Check' button lower down the page to see if you got it right! 1. What is the name for the longest side of a right angled triangle? 2. What is the length of the longest side of a right angled triangle if the two shorter sides are 5cm and 12cm? 3. Find the length of AB to 1 decimal place. 4. Find the length of EG to 1 decimal place. 5. Find the length of JK to 1 decimal place. 6. A rectangular swimming pool is 21m wide and 44m long. Calculate the length of a diagonal in metres to 1 decimal place. 8. A tent guy line supports one of the upright tent poles. It runs from the top of the pole to a peg in the ground two and a half metres away from the base of the pole. If the guy line is 434cm long, how tall is the upright tent pole? Give your answer in centimetres correct to the nearest centimetre. 9. How long is the diagonal of an A4 size sheet of paper? The dimensions of A4 paper are 210 by 297 millimetres (8.3 inches × 11.7 inches). Give your answer in cm to one decimal place. 10. For international matches football pitches must be of regulation size. The goal lines must be between 64 and 75 metres (70 and 80 yards) long and the touchlines must be between 100 and 110 metres (110 and 120 yards). What is the difference between the length of the diagonal of the largest acceptable pitch and the length of the diagonal of the smallest acceptable pitch? Give your answer in metres to the nearest metre. 11. Find the length of a side of a rhombus whose diagonals are of length 13km and 15km. Give your answer in kilometers correct to one decimal place. 12. Find the perimeter of this parallelogram to one decimal place. 13. The length of the diagonal of a square is 54m. How long are the sides of the square? Give your answer correct to one decimal place. 14. 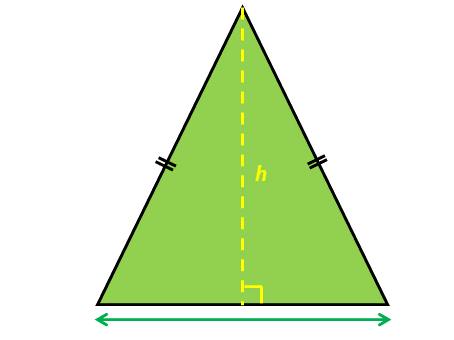 Find the height (h) of this isosceles triangle to one decimal place. 15. The sign says 'Keep off the grass'. Each day Michael has to get from one corner of the rectangular area of grass to the opposite corner. If the park keeper is looking he will walk along the edges but if the park keeper is not looking he will take the direct route, diagonally across the rectangle. How much further does Michael walk on the days when the park keeper is looking? The length of the rectangular area of grass is 149m and the width is 117m. Give your answer to the nearest metre. 16. 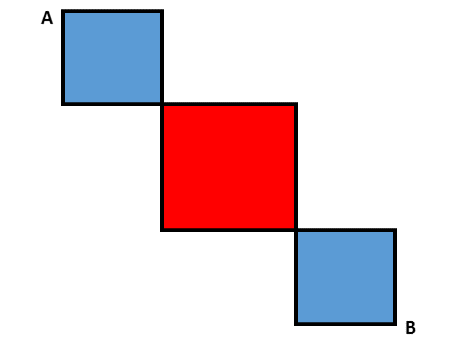 The blue squares have sides of length 30mm and the red square has sides of length 46mm. Find the distance from A to B in centimetres correct to one decimal place. 17. 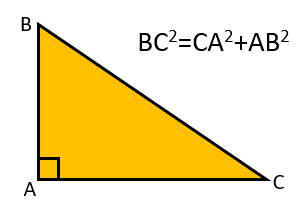 An irregular quadrilateral ABCD has right angles at the opposite vertices A and C. Calculate the length of the side DA if AB=36.9cm, BC=38.8cm and CD=40.4cm. Give your answers in cm to one decimal place. 18. An aeroplane flies due north for 297km then changes direction and flies east for 407km. How far is it now in a straight line from its starting position. Give your answer to the nearest kilometre. 19. A ship sails on a bearing of 045o for 307km then changes direction and sails on a bearing of 135o for 437km. Finally it then turns and sails for 117km on a bearing of 225o. How far is it now in a straight line from its starting position. Give your answer to the nearest kilometre. 20. One side of a right angled triangle is 10cm. 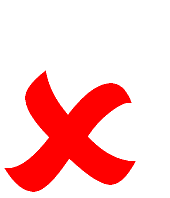 The other two sides are both of length x. Calculate x to 3 significant figures. Exam Style questions requiring an application of Pythagoras' Theorem and trigonometric ratios to find angles and lengths in right-angled triangles. 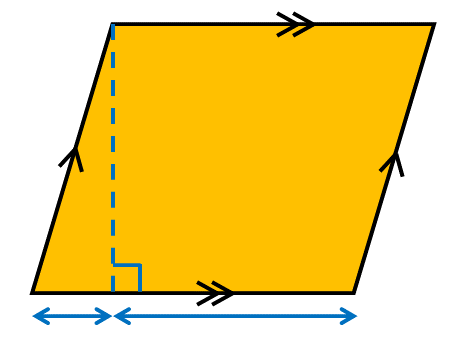 The area of the square on the hypotenuse of a right angled triangle is equal to the sum of the areas of the squares on the two shorter sides. You may have learned the theorem using letters to stand for the lengths of the sides. The corners (vertices) of the right-angled triangle is labelled with capital (upper case) letters. The lengths of the sides opposite them are labelled with the corresponding small (lower case) letters. Alternatively the sides of the right-angled triangle may me named using the capital letters of the two points they span. As triangle can be labelled in many different ways it is probably best to remember the theorem by momorising the first diagram above. To find the longest side (hypotenuse) of a right-angled triangle you square the two shorter sides, add together the results and then find the square root of this total. To find a shorter side of a right-angled triangle you subtract the square of the other shorter side from the square of the hypotenuse and then find the square root of the answer. The diagrams aren't always the same way round. They could be rotated by any angle. The right-angled triangles could be long and thin or short and not so thin. So why is Pythagoras' theorem true? The video above is from Australia's most unlikely new celebrity, Eddie Woo.